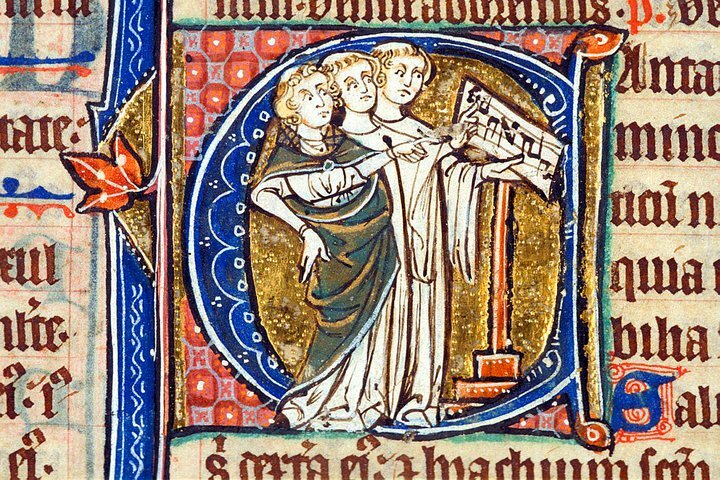 Who is writing about classical music? In recent years, the coverage of high art in (predominately but not exclusively American) newspapers and other print media has decreased precipitously. Like print media, classical music’s death has often been prophesied, or even announced, and its increasing absence from mainstream media is often cited as a sign of its ostensible decline. But what if the coverage just moved? The internet—a giant and rapidly changing place that means radically different things to different people—is host to an enormous variety of people writing about music. If you look at the classical music blogosphere, you don’t see a dead culture (hell, for habitues of Parterre, Maria Callas isn’t even dead). It’s a weird and wonderful place full of writing similar to newspaper coverage but also very specific subcultures and rants. Some the writing is fantastic and some is awful—just like the rest of the internet, in other words. A problem remains: with established print media, the institutional credibility of the publication backs up the critic, which if it’s a good paper should serve as some kind of guarantee of quality. On the internet, anyone can write anything according to any standards of ethics, knowledge, etc., and while some are associated with one of those old-fashioned print media most are not. Some people think this is a Very Bad Thing. But I think it’s great. Bloggers are judged solely by the quality of their work. Sometimes artists and performing groups have no idea what to do with us. Sometimes, though, they have no idea what to do with print journalists either, as has been abundantly clear in recent days. The amount of independence and objectivity in print is hardly black and white. And bloggers, for all of our variability, aren’t going to be shut up like that. But I was curious: who are these people writing stuff? What have been their (our) experiences? 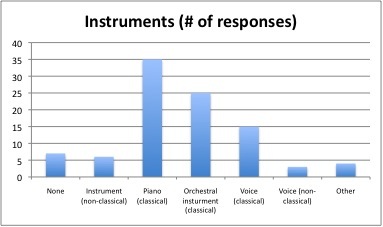 During the first two weeks of May, I conducted a survey of all the classical music bloggers I could convince to complete one. 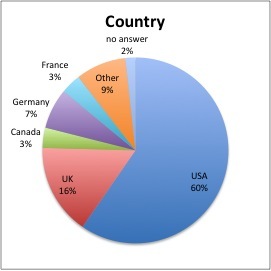 Due to my network, the respondents were mostly American, and many were opera bloggers. These two groups may have been overrepresented, but it’s also true that there are a lot of Americans and a lot of opera bloggers out there. Thanks to Colin Eatock’s Big List of Classical Music Blogs and some help on the Twitter, I found some people new to me too. It’s not quite scientific, but I tried to be as accurate and scrupulous as possible. 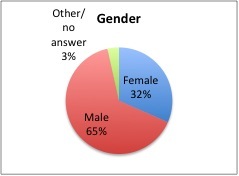 65% were male, 32% were female. This is actually not as male-dominated as I thought it would be. Geographically, the San Francisco Bay area was most represented with seven bloggers. Several of them reported excellent camaraderie between each other, print critics, and presenting organizations, suggesting strength in numbers. Also that Californians might be more internet-savvy than the rest of the world. 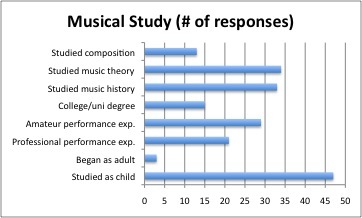 82% of bloggers began to study music as children. While their expertise varied, it’s clear that early education is very important in keeping people involved in music. (Parents, this is aimed at you!) Many also had studied music in college. Many bloggers have real writing experience. 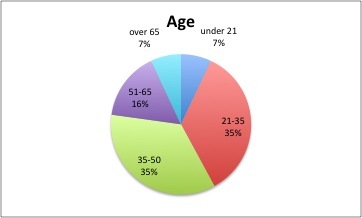 57% had written at some point for a news or arts website other than their own blog. 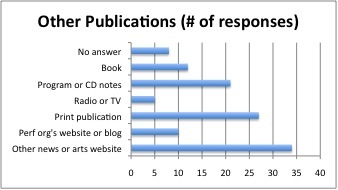 47% had also written for print, and 21% had written books. 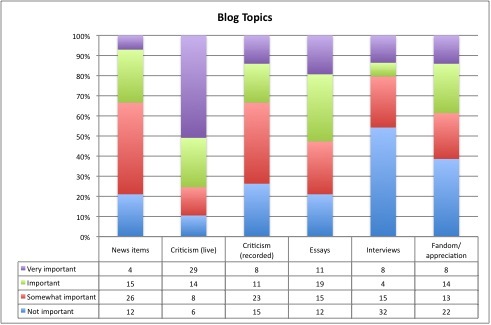 Criticism of live performances was considered by the most people to be the most important topic, while interviews were the least (suggesting that bloggers either aren’t interested but also possibly do not always enjoy easy access to interview subjects). 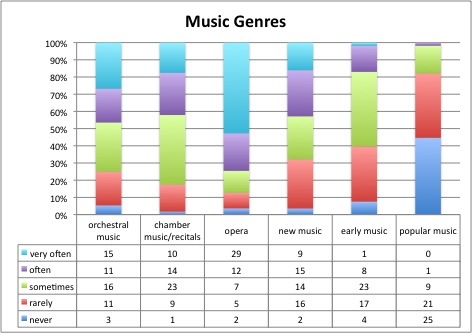 Opera was the genre of music covered most often while popular music was covered the least. Around half of bloggers have received free tickets for performances, and many reported contact from presenting organizations and artists over what they’ve written, suggesting that the Power of the Internet is great. Some reported friendly thanks or offers of photos and information, and some also reported rants or hate mail. You can download a full report with all the statistics and selected comments from the long form questions here. (Go to File, then Download.) Please credit me if you’re going to write about it. 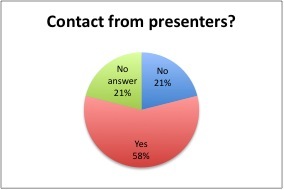 Here are the detailed results. Click on any of the charts below to enlarge. Thanks to Lisa for her advice on putting together the questions and to all the bloggers who participated! See PDF for additional comments on musical education, mostly including a wide range of academic degrees. issues, satire and humor, historical topics, politics, calendar posts. Is your blog affiliated with an institution? Have you been quoted in any publicity materials? Have you accepted any free stuff from publicists/performing organizations/artists/etc.? the content of something you’ve written on your blog? Comments included both friendly and helpful interactions and some hostile ones, including rants and hate mail. Additional comments included warm words for the blogosphere and the options it offers, and a certain disinterest in print critics. It's a CONSTANT TOPIC in the English-language press–maybe not as much elsewhere. Good examples are Norman Lebrecht (http://www.amazon.com/The-Life-Death-Classical-Music/dp/1400096588/) and this guy: http://www.artsjournal.com/sandow/. "Some the writing is fantastic and some is awful"
Could you cite a few recent examples? Fascinating results! Thanks for doing the legwork. The opera/classical blogosphere definitely warrants further investigation, imho. Anon #4–I think the overall level is pretty high, and I'm standing up for the overall importance bloggers' work with this survey, so it's odd you picked that one phrase out. But I think I'm just acknowledging reality to say it ain't all good. Just try looking through the entries of the recent Spring for Music contest or the guest writers at Parterre and you'll find some clunkers. "or the guest writers at Parterre and you'll find some clunkers"
Oh yes I quickly forgot about "Lenny Abramov's" piece @ Parterre. That was cring-inducing. Anon 7, ironically enough THAT piece (which also made me cringe) was probably by a "real" print critic! (I wasn't even thinking of that, actually, their CD reviews are very inconsistent.) There's plenty of junk out there but I'd like to think that bloggers who put a little effort into promoting their work eventually get the audiences they deserve. "Anon 7, ironically enough THAT piece (which also made me cringe) was probably by a "real" print critic!" Thanks for doing this! I'm surprised (pleasantly!) 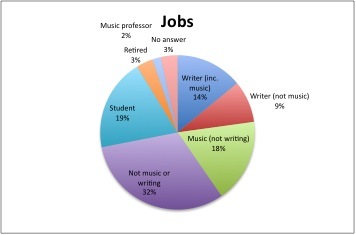 by the high numbers of bloggers with a fairly advanced musical education; very interesting. I have to say I'm also surprised by the gender imbalance, but if anything I would have expected it to tilt the other way. Belated thanks! Interesting results. I wasn't at all surprised by the gender imbalance; for whatever reasons, men are usually more willing to put their opinions out there. We at Auroraare trying to join the List Top Engineering Collegesby creating new practices in the Engineering Education in India. We request you all to have a look and let us know how we can improve our quality of deliverables. I was interested in the comment about interviews. I think interviews are traditionally arranged by the editorial staff, which of course the blogger does not have. However Tattler does seem to interview people. Maybe I should ask her.